In Southern Thailand, two of the top tourist destinations are Phuket and Krabi. On the one hand, Phuket is a lively place that’s seen plenty of tourist development yet still offers fabulous beaches and a variety of other attractions. Krabi Town, on the other hand, is bustling yet offers quite a relaxed pace of life that gives visitors a more accurate look at Thailand than its nearby beach resorts of Ao Nang. This contrasting atmosphere between Phuket and Krabi is what makes both destinations so popular with tourists, and traveling from one to the other is really quite easy as well as being incredibly scenic. Read on to find out how to travel from Phuket to Krabi. Options for Travel from Phuket to Krabi? First off, the distance between Phuket and Krabi really isn’t much, so traveling between these two destinations is relatively quick and easy. If we take the distance from bus terminal to bus terminal it is only 165 kilometers (103 miles), so depending on how you’re traveling and what the traffic is like, you could be looking at a journey time of between 2 and 3 hours. By road you have several options including bus, minibus and taxi, but you can also travel from Phuket to Krabi by boat, so we’ll start by giving you more information on the ferries and speedboats. The nice thing about taking the ferry from Phuket to Krabi is that it’s incredibly scenic and a relatively comfortable way to travel because you can walk around and stretch your legs far more than you can when traveling by bus. The drawback with the ferry from Phuket to Krabi is the time it takes, this is definitely a slow boat to Krabi, with journey times of around 8.5 hours, but if you’re not pushed for time it’s a really great experience, cruising past beautiful islands and catching the sun. But, there’s a very good reason why the ferry takes 8.5 hours – in fact, you won’t be on the ferry for that entire time as it includes a 5-hour stopover on the island of Phi Phi! 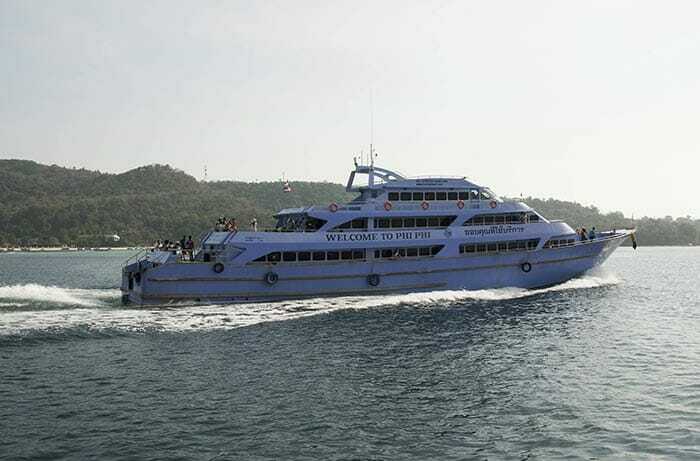 The ferry departs from Phuket at 8.30am, arrives at Phi Phi around 10.30am, and departs from Phi Phi at 3.30pm. You’ll likely pay more for the ferry ride than you would by bus from Phuket to Krabi, but if you were thinking about visiting Phi Phi anyway then the ferry is certainly a good option. Speedboats are another option if you enjoy traveling on the water. Compared to bus, taxi, minibus and ferry, speedboats are the fastest way to get from Phuket to Krabi, however, they do not arrive in Krabi Town itself. Speedboats take a route that terminates in the resort town of Ao Nang, about 19 kilometers (12 miles) from Krabi Town by road, so do be aware of this if choosing this option. While fast (it takes around 1 hour 20 minutes from Bang Rong Pier) speedboats are also the most expensive form of transportation from Phuket to Krabi. If you don’t like the cost of speedboats, or the extended time it takes for ferries, don’t worry, there are still plenty of transport options between these two destinations. Buses are the most commonly used transport for several reasons: they depart frequently so you’ll never have to wait too long for one, and they are cheap. Journey times are usually somewhere between 2.5 and 3 hours on these government-run buses and it’s a nice way to meet some locals and spend time looking at the passing scenery. The drawback with the buses is that they are point A to point B – so you’ll have to make your own way to and from the bus terminal in each town. In Phuket, it’s best to pick up from Phuket Bus Terminal 2 as there are more frequent departures from here. Minibuses are another option and they offer a little more convenience. 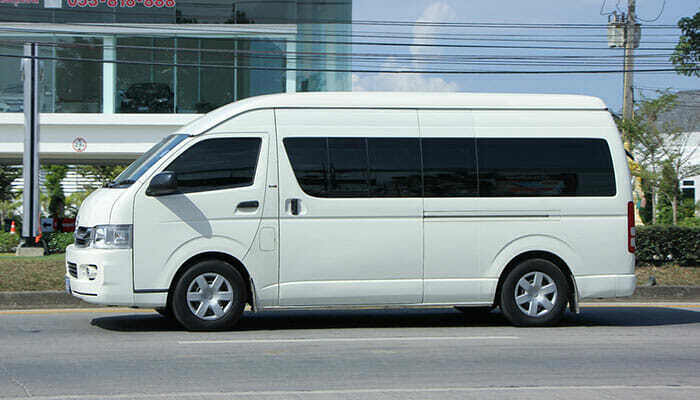 If you book a minibus from Phuket to Krabi you can usually get them to pick you up direct from your hotel, saving you the journey time and cost of getting to the bus terminal. A minibus costs a little more than the buses do, but it’s worth the money for that door-to-door convenience. Downsides to minibuses are that you’ll have a little less legroom than on a bus, and, it can be tedious having to stop at lots of hotels before really getting under way. However, once all the pickups have been completed, the drive will be fast (and potentially hair-raising!) All in all, you should be looking at about a 2-hour journey time. The final option is to travel by taxi from Phuket to Krabi. You could argue that a taxi will be a bit more comfortable than a bus or minibus, and it offers greater flexibility. Service will be door-to-door, and, if you like, you can even get the driver to stop at some places of interest along the way. Taxis are, of course, far more expensive than buses or minibuses and the price is more comparable to what you’d pay on a speedboat. However, the taxi rate can be split between several passengers, making it more affordable. Depending upon where in Phuket you’re traveling from, the drive should take around 2 hours. Bangkok Attractions is made by people who want to share their experiences to the world and give something back to the city we love.